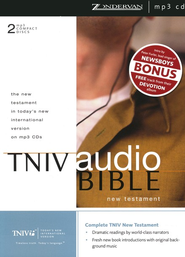 New Testament Unabridged Audio Bible:Introducing the TNIV New Testament, Audio CD multi-voice edition---an audio Bible for today's generation, from Zondervan, publisher of the Audie Award-winning NIV Audio Bible Dramatized. Featuring a fresh, new translation in today's language, dramatic readings from some of the world's best voice talent, original music, and engaging book intros, the TNIV New Testament Audio Bible sets a new standard. Endorsed by scholars and pastors across the country, the TNIV is the new translation for today's generation. It combines uncompromising reliability, the clarity of today's language, and the heritage of the most trusted translation, the NIV.